“As far as the Roman Curia is concerned, for the moment I will stop here, even if the names of other prelates in the Vatican are well known, even some very close to Pope Francis, such as Cardinal Francesco Coccopalmerio and Archbishop Vincenzo Paglia, who belong to the homosexual current in favor of subverting Catholic doctrine on homosexuality...Cardinals Edwin Frederick O’Brien and Renato Raffaele Martino also belong to the same current, albeit with a different ideology. Others belonging to this current even reside at the Domus Sanctae Marthae. 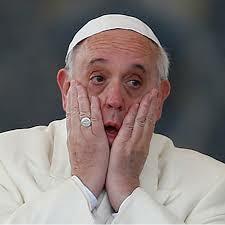 I want to recall...the grave, disconcerting and sinful conduct of Pope Francis and by the conspiracy of silence of so many pastors, and who are tempted to abandon the Church, disfigured by so many ignominies. At the Angelus on Sunday, August 12, 2018 Pope Francis said these words: “Everyone is guilty for the good he could have done and did not do ... If we do not oppose evil, we tacitly feed it. We need to intervene where evil is spreading; for evil spreads where daring Christians who oppose evil with good are lacking.” If this is rightly to be considered a serious moral responsibility for every believer, how much graver is it for the Church’s supreme pastor, who in the case of McCarrick not only did not oppose evil but associated himself in doing evil with someone he knew to be deeply corrupt. He followed the advice of someone he knew well to be a pervert, thus multiplying exponentially with his supreme authority the evil done by McCarrick. And how many other evil pastors is Francis still continuing to prop up in their active destruction of the Church! — TESTIMONIANZA di Mons. Carlo Maria Viganò, (22 August 2018). Things are getting mighty interesting aboard the S.O.S. Novus Ordo with Francis as the Captain!